Sean Hehir (Rathfarnham) and Pauline Curley (Tullamore Harriers) will be bidding to retain their national titles as the East Africans will surely dominate the head of the record field at the SSE Airtricity Dublin Marathon this Sunday (October 30). Hehir won the Dublin Marathon in 2013 in a time of 2:18:19 and won the national title last year. In April this year, he ran a personal best time of 2:17:20 in London and just missed out on selection for the Rio Olympics. Sergiu Ciobanu (Clonliffe Harriers), another to have narrowly missed out on Rio selecation, ran a personal best time of 2:15:14 in Berlin last year and will be bidding for national glory. Other contenders include Mark Kirwan (Raheny Shamrock) who also set a personal best time of 2:19:30 in Berlin last year; Gary O’Hanlon (Clonliffe Harriers) is Ireland’s most prolific elite marathon runner and continues to win marathons here in Ireland on a regular basis. He set a personal best time of 2:21:42 in London last April. An interesting entry is David McCarthy (West Waterford) who has excelled on the track with a 3:55 mile and bronze medal over 5,000m metres at the European U23 Championships in 2009. His fellow club mate Philip Harty should also feature in a battle for podium positions along with Eoin Flynn of Rathfarnham. The evergreen Pauline Curley (Tullamore Harriers) is as prolific on the roads as Gary O’Hanlon and she will be looking to add gold to her surprise victory last year. The Offaly woman, who ran in the Beijing Olympics, had only recently recovered from knee surgery last year. She will face stiff competition from Fionnuala Ross (Armagh) who set personal bests in 2016 for the marathon and half marathon – 2:49:57 in London and 74:15 for the half marathon. Laura Graham (Mourne Runners) only started running in 2014 but has since progressed to 2:48:03 in London this year. She ran 2:56:46 last year to bag bronze in Dublin and a time of 78:51 saw her win the national half marathon title in August as part of the Rock ‘N’ Roll event. Norah Newcombe Pieterse (Mayo) should also feature while Caitriona Jennings (Letterkenny), who was third in the SSE Airtricity Dublin Half Marathon in 80:33, will be another strong conteder. She ran 2:44:33 in Rotterdam last April. Her best time is 2:36:17 which she also recorded in that event in 2012 to qualify her for the Olympics. Le Cheile's Patrick Monahan will be looking to win the wheelchair title. 19,500 runners will toe the line in the capital which also incorporates the national marathon championship that has also seen a huge upsurge in numbers. Last year 3,200 Athletics Ireland club members ran and this year will see close to 6,000 take part in the national championship. West Waterford had the novel idea of marking this historic occasion in Irish history by having 100 members sign up and they have surpassed that with 150 – the largest club entry for 2016. Other clubs with large entries are Clonmel, Slaney Olympic, Drogheda & District, Crusaders A.C, Finn Valley and Raheny Shamrock. See the elite list below courtesy of SSE Airtricity Dublin Marathon. Fikru ran the Dublin Marathon last year and returned recently to finish in 2nd place in the SSE Airtricity Dublin Half Marathon. Lezan is a regular visitor to Dublin and a winner of the event in 2004 in a time of 2.13.08. This is Peter’s first trip to Dublin and he is a training partner of Lezan Kimutai. Has the following personal best times: 10K 28.49. Half Marathon 64.12 and marathon time of 2.17.28 from 2013. 2014 9th place Cape Town Marathon 2.17.58. Leswene is coached by former Dublin Marathon winner, Zacharia Mpolokeng. 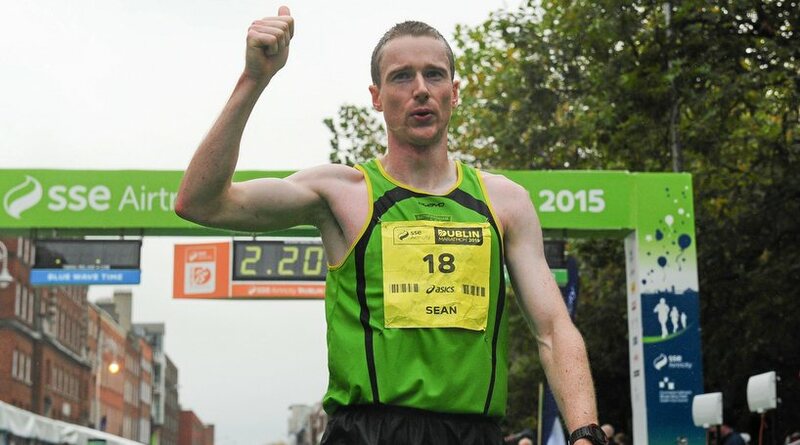 Sean won the Dublin Marathon in 2013 in a time of 2.18.19. In April this year, he ran a personal best time of 2.17.20 in London and just missed out on selection for the Rio Olympics. He has a half marathon best time of 1.05.12 from Cardiff 2013. Sergiu ran a personal best time of 2.15.14 in Berlin last year and narrowly missed out on selection for the Rio Olympics. He has a half marathon best time of 1.04.48 from Omagh 2012. Mark set a personal best time of 2.19.30 in Berlin last year. Gary is Ireland’s most prolific elite marathon runner and continues to win marathons here in Ireland on a regular basis. He set a personal best time of 2.21.42 in London last April. Philip has a personal best marathon time of 2.21.53 from Berlin 2013. Earlier this year, he won the Limerick Half Marathon in a time of 1.09.46. This will be a big step up for David who has some very fast middle distance times. He won the bronze medal at the 5000 metres in the European U.23 Championship in 2009. Eoin has a best time of 2.25.01 from 2014. Motu trains with Olympic bronze medallist, Mare Dibaba. This will be her debut marathon. 2011 winner of the Dublin Marathon in a time of 2.30.37. Alina has a personal best time of 2.33.09 from the Mungyeong Marathon in 2015 where she finished in 4th place. She won the Namibian National Championship in 2013 in a time of 2.35.33.